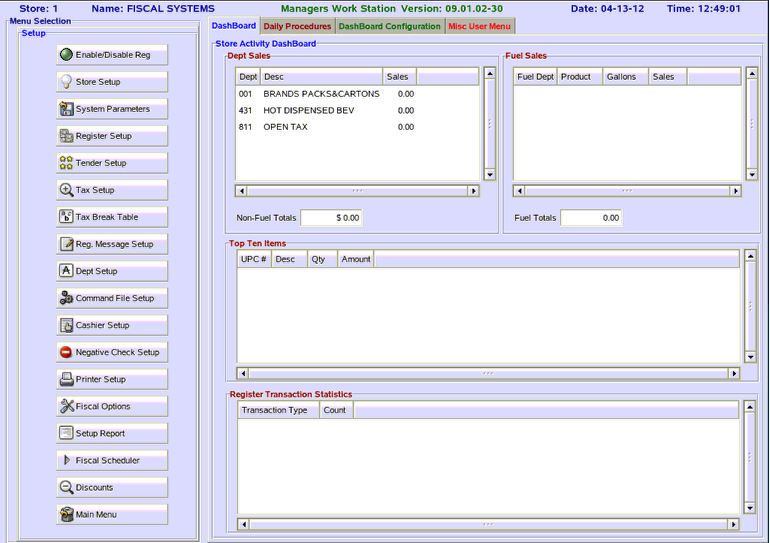 TravStar1 Point Of Sale SystemManager's Work Station IntroductionHow Do I Navigate the Manager's Work Station? How Do I Navigate the Manager's Work Station? This lesson will teach you the basic screens on the Manager's Work Station and the function of each. The modules in your system are displayed on the left side of the screen under the header Menu Selection. 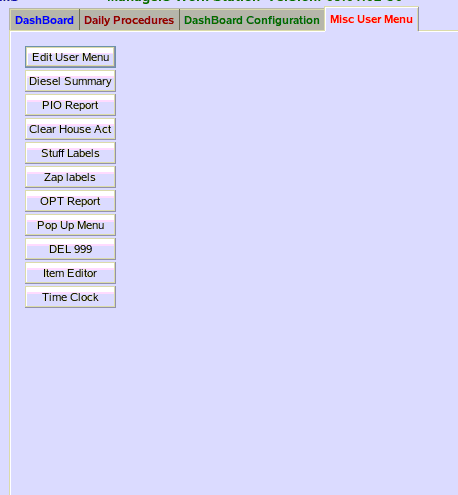 The right side of the screen is a DashBoard that displays current activity that is going on in the store. Across the top right of the Manager's Work Station screen, there are four tabs. Use your mouse to click on each of tabs to display different information. The first tab the DashBoard is a view into the days sales. There are four different sections under the DashBoard. 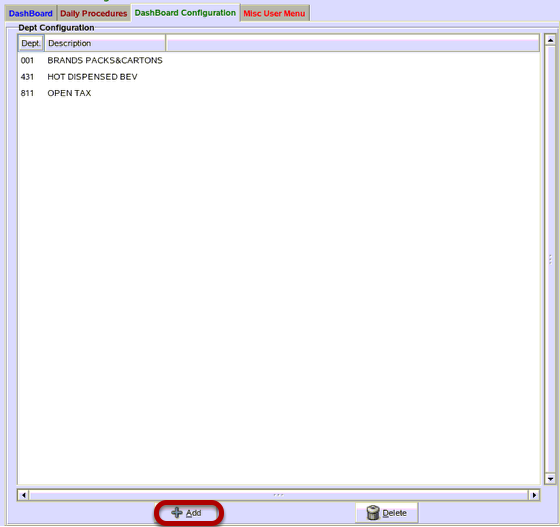 Dept Sales - displays the department sales total from the list of store departments setup in the DashBoard Configuration. 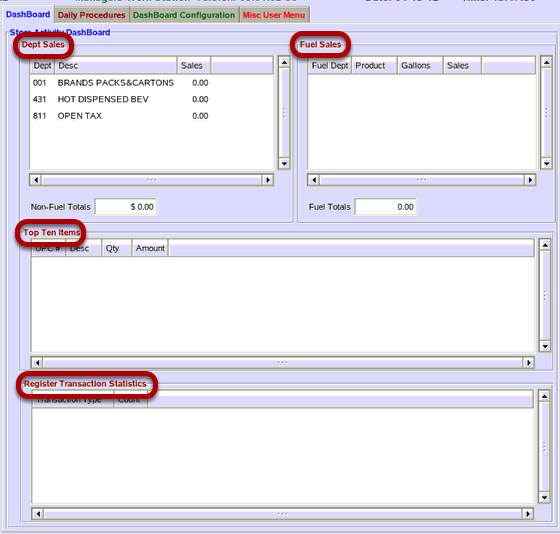 Register Transaction Statistics - displays transactions statistics from registers/cashiers. These include: voids, returns, canceled sales, no sales, and total number of item sales. The Daily Procedures tab is the suggested daily To-Do list for the manager. Each of the buttons is a shortcut to another location on the Manager's Work Station. For additional information on each of the daily procedures please read How Do I Close The Day On The Manager's Work Station? Choose a department from the drop down menu, then click on the "OK" button. The new deparment is now added. 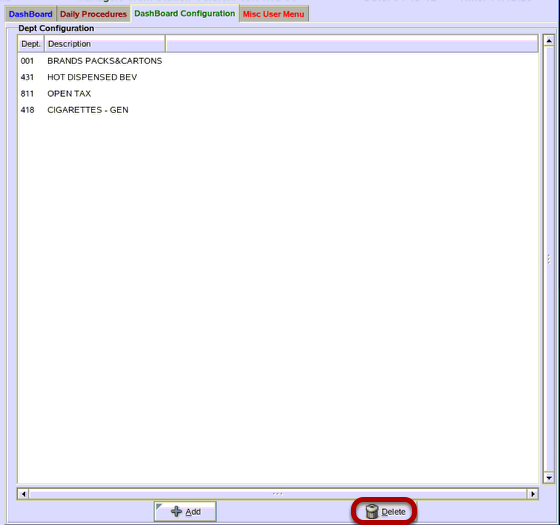 Click on the "Delete" button to remove a department. 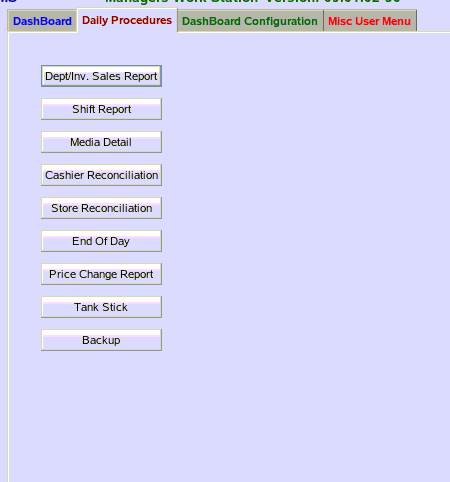 The Misc User Menu is a screen that can be used to add additional reports or create shortcuts to modules within the Manager's Work Station. Prev: How Do I Login to the Manager's Work Station? Next: How Do I Setup a Cashier?